TERGO® UFW Four-way reach truck. 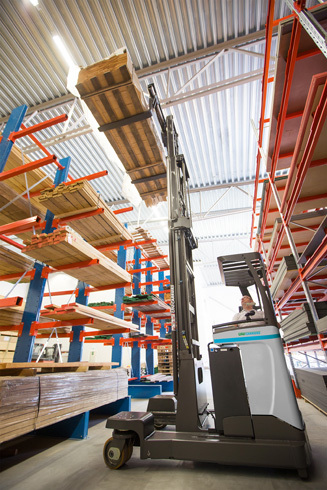 Keeping aisles to a minimum, the powerful multi - directional reach truck TERGO® UFW offers flexible handling of long and other bulky goods or pallet loads – with superior ergonomics and comfort. TERGO® UFW multi directional reach truck is ideal when handling both long loads and standard pallets with a lifting height of up to 9.7 meters. The truck can be driven in all directions with precision and the aisle width can be cut to 2.3–3 meters. With superior acceleration, a top speed of 13 kph and high battery capacity, the truck can be driven intensively with maximum efficiency. The TERGO® features advanced ergonomics, like UniCarriers unique mini steering wheel and adjustable 18° tilting seat – all results of independent research into the effects of repetitive strain injury (RSI). Excellent all-round visibility according to the ProVision concept with angled bars in the overhead guard, clear view mast and a high seating position, together with a wide range of optional equipment, make the operator even more productive. This is a winner for any company that cares about its operators, economy and maximum efficiency. Are you interested in the UniCarriers UFW? Powerful AC motors provide powerful acceleration and market leading drive and lift performance. 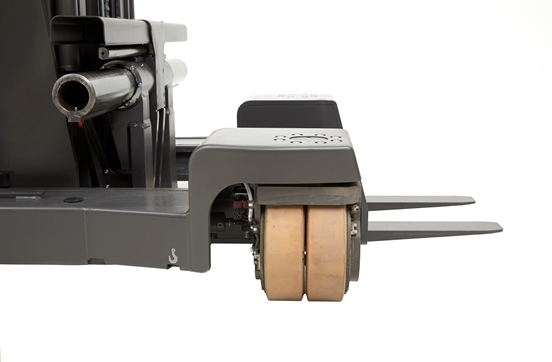 The CAN-open system controlled by the truck computer and individual PIN ensures optimal performance and safety for each operator. The multi-directional truck allows efficient material handling for a wide range of loads, and especially long loads due to the ability to travel sideways, thus keeping aisles to a minimum even with very long loads. A standard hydraulic fork spreader ensures the load to be handled safely all times. The synchronic steering system makes it easy to change direction for high throughput. Smart modular design using fewer components increases availablity. Engineers carry the most common parts on their vehicles. On board diagnostics and built in service menu using the truck computer ensures a market leading First Visit Fix Rate, FVFR. For even higher productivity in multi shift operations, Tergo UFW is designed for easy and quick battery changeover systems. The Stability Support Systems S3 and S3-2 ensure industry leading safety performance by automatically controlling speed, steering and lifting systems when driving. Knowing that the systems will improve safety, drivers feel confident to use the full performance of the truck, resulting in increased productivity and lower cost of operation. The outstanding driver compartment is designed to get the best out of the operator for maximum output. The unique, ergonomically designed mini steering with floating armrest, fully adjustabiliy of seat with built in 18° tilt function and height adjustable floor, together with Ergologic multifunction control, makes TERGO® UFW most flexible for different operators. Combined with individual PIN settings this ensures that all drivers can operate in a comfortable environment. Entry is made easy by the low instep and a smartly positioned instep handle.